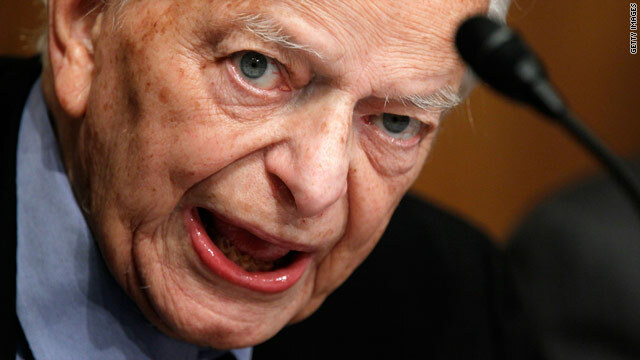 Sen. Robert Byrd was the longest-serving member of the U.S. Congress. Washington (CNN) -- The body of Sen. Robert Byrd, D-West Virginia, will lie in repose in the U.S. Senate chamber on Thursday, two Senate aides familiar with the plans told CNN. 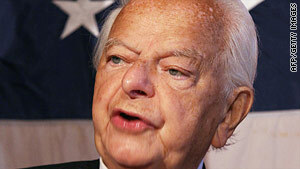 Byrd, the longest-serving member of the U.S. Congress, died Monday. He was 92. Byrd served for six years in the House before moving to the Senate, where he served nine terms. Byrd will lie in repose in a closed casket from 10 a.m. to 4 p.m. ET, a senior Senate aide said. Senators and others will be asked to be in the chamber at 10:30 a.m., when Senate chaplain Barry Black will give a prayer. It was unclear whether members of the public would be on the floor or watching the proceedings from the visitors' gallery above. Byrd's body will also lie in repose at the West Virginia state Capitol from 9 p.m. Thursday to 9 a.m. Friday, West Virginia Gov. Joe Manchin's office said in a statement, and "the public is invited to pay their respects. "A public, formal memorial service will also take place (at) 11:30 a.m. Friday at the state Capitol's North Plaza," the statement said. Manchin has ordered flags flown at half-staff at state facilities in Byrd's honor, and ordered the lights of the state Capitol dome turned off until further notice. On Monday, West Virginia Secretary of State Natalie Tennant said there will be no election this year to fill the remaining time in Byrd's term, and that the election will take place in 2012. But the timing of Byrd's death contributed to confusion about filling the remainder of his term. Two elections will be held in November 2012, Tennant said -- one to fill the remaining two months of Byrd's term and one for the new six-year term in the Senate that begins in January 2013.